The Pangere Corporation was selected for the construction of Feralloy’s new processing facility, which included over 120,000 square feet of manufacturing space with an additional 3,000 square feet for office use. The new facility’s design and location gives easy access to transportation through the Port of Indiana and nearby railroad and trucking services. 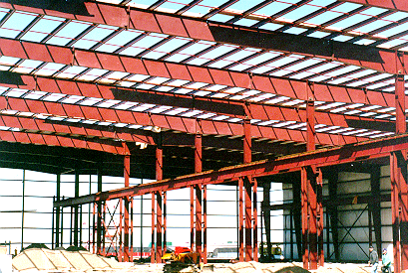 With three processing lines, The Pangere Corporation provided structural design services, steel erection, and installed numerous overhead cranes throughout the building to meet customer production needs. In addition, Pangere performed the installation of the standing seam roof, metal wall panels, acoustical ceilings, metal studs and drywall, hollow metal doors and frames, cabinetry, as well as the painting and decorating services.